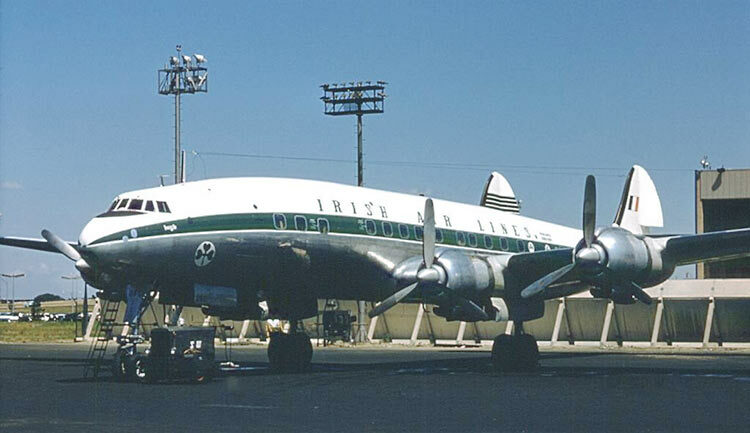 Seaboard Connie N1005C wet-leased to Aer Lingus at what was then Idlewild, July, 1959. This aircraft has quite an interesting history. It was built as an "E" model and first operated by Cubana. It was later converted to a "G"; perhaps when Seaboard got it. Seaboard got it because BOAC wanted an aircraft with more windows for the trips to Bermuda that Seaboard flew for BOAC in 1955 and 1956 than Seaboard's 1049D's had. Its last operator was Capitol Airways. After that, it became a cocktail lounge on top of a restaurant in Penndel, PA! It is now at the Air Mobility Command Museum at Dover AFB, Dover, DE undergoing conversion for display as a C-121.